Before FVM started work in Taulo, the assessment exercise revealed that there were no programs to help the development of the children in the area. There were no nursery schools. The assessment also showed that high level of poverty has been one of the contributing factors of not being able to start community based child care centres (CBCC) as the community members lacked basic resources to construct one. FVM started by involving the community members in planning for the development of their community through preschool education and feeding programs. Providing the caregivers and instructors with training and effective learning materials was a key contributor to the success of this program. In collaboration with Malawi Government and other NGOs like Emmanuel International and Save the Children, FVM has been building capacity in volunteers since 2010. The ongoing training is intended to update these volunteers with information as regards to child development including education so that they remain effective in the delivery of child care activities like feeding and education. FVM has been providing books, pens, pencils and rubbers, balls and other playing materials since 2010. This has eased the work of volunteers and has provided a conducive learning environment to children. The volunteers have been making sure the learning and playing areas are conducive all the time. 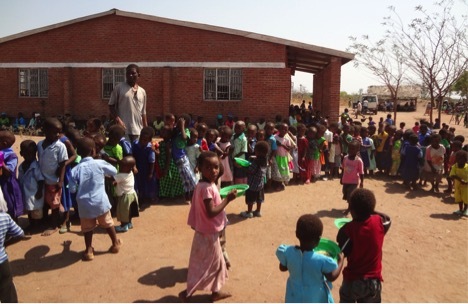 Since 13 September, 2010, FVM has been providing nutritious food to more than 700 children (ages 2-8 years) annually. This has improved the health status of children and reduced some food deficiency diseases. It has also decreased school dropout rate as children have their stomach full of food. The food is given five days in a week, and the communities have been participating whole heartedly in preparing the food for their children. The children are able to play thereby developing in all domains of development.